Columbia Pictures cranked out 52 films in the year 1945, mostly ‘B’ movies with titles like LET’S GO STEADY, I LOVE A MYSTERY, EVE KNEW HER APPLES, ROCKIN’ IN THE ROCKIES, TEN CENTS A DANCE, and THE ADVENTURES OF RUSTY, along with their continuing series featuring Blondie, Boston Blackie, The Crime Doctor, The Durango Kid, and The Whistler. They were programmers, budget jobs, designed to fill a double bill and a theater’s seats, bread-and-butter movies with no pretenses to reach any artistic heights. 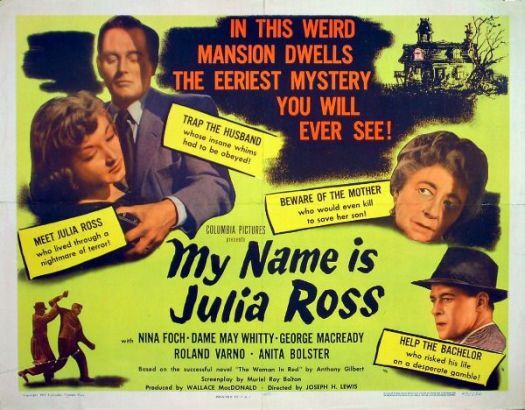 This entry was posted in Film, Film Review and tagged Burnett Guffey, Columbia Pictures, Cracked Rear Viewer, Dame May Whitty, film noir, Gary Loggins, George Macready, Joseph H Lewis, My Name is Julia Ross, Nina Foch, Through the Shattered Lens. Bookmark the permalink.